LOGAN, George, a Senator from Pennsylvania; born at Stenton, Philadelphia County, Pa., September 9, 1753; was sent to England for his schooling; returned to America and was apprenticed to a merchant; graduated in medicine from the University of Edinburgh, Scotland, in 1779; devoted himself to scientific farming; member, State house of representatives 1785-1789, 1795-1796, and 1799; went to France in 1798 to treat unofficially for a better understanding between the two Governments, which action was subsequently responsible for the passage of the so-called Logan Act in 1799, prohibiting a private citizen from undertaking diplomatic negotiations; appointed and subsequently elected as a Democratic Republican to the United States Senate to fill the vacancy caused by the resignation of John Peter G. Muhlenberg and served from July 13, 1801, to March 3, 1807; declined to be a candidate for reelection; despite the Logan Act, went to England in 1810 on a private diplomatic mission as an emissary of peace, but was not successful; published several agricultural pamphlets; died at Stenton, near Philadelphia, Pa., April 9, 1821; interment in the Logan Graveyard in Stenton Park, Philadelphia, Pa. Dictionary of American Biography; Logan, Deborah (Norris). Memoir of Dr. George Logan of Stenton. Edited by Francis Armatt Logan. Philadelphia: Historical Society of Pennsylvania, 1889; Tolles, Frederick. 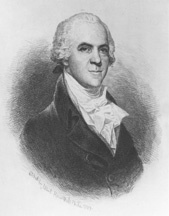 George Logan of Philadelphia. 1953. Reprint. New York: Arno Press, 1972.